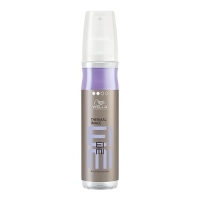 Wella Professionals EIMI Thermal Image is fabulous heat protection spray with a medium hold. Suitable for all hair types and lengths, EIMI Thermal Image is specially formulated to protect the hair against heat damage from hot stylers. This miraculous styling spray not only guarantees protection and instant hold, but also ensures that the hair remains healthy and hydrated. Provide a glamorous finish to any look and protect any design with the incredible EIMI Thermal Image.